Perfect for laid-back beach travelers, a Molokai honeymoon offers an authentic way to experience Hawaiian culture and outdoor adventure on your honeymoon. If you’re looking for a laid-back romantic getaway destination, then we think you should plan a Molokai honeymoon. This friendly Hawaiian Island has fewer tourist facilities than other tropical locales, which means during your Molokai honeymoon you’ll likely have the island’s beautiful beaches to yourselves. The island is a veritable paradise with pristine beaches, impressive waterfalls, volcanic mountain peaks and lush, green jungles. 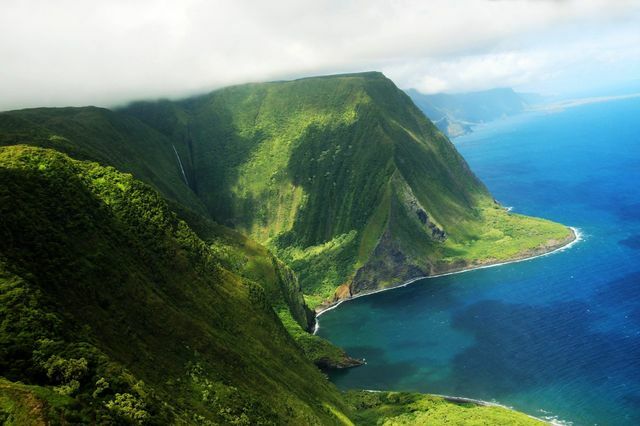 Molokai also has the highest sea cliffs in the world, which are perfect for hiking and exploring. Just offshore, you’ll find one of Hawaii’s largest barrier reefs making the diving and snorkeling particularly top-notch here. If you're looking for an authentic way to experience Hawaiian culture and outdoor adventure, a Molokai honeymoon is ideal! The temperatures in Molokai are nice year round with the hottest months being July through September. July, March and February are the busiest months when hotels and flights will be more expensive for a Molokai honeymoon. Kalaupapa Leprosy Settlement and National Historic Park: A former leper colony, now a remote memorial with stunning views. Molokai Museum and Cultural Center: A local history and cultural museum that occupies a restored sugar mill. Pala’au State Park: A state park with great views, camping, trails and a romantic beach perfect for visiting during your Molokai honeymoon. Pu’uka’oku Falls: World’s 8th highest waterfall along some soaringly high sea cliffs. Usually seen only by boat or helicopter. Kamakou: A volcanic mountain, the tallest on Molokai with rainforest, hiking and scenic vistas. Molokai Mule Ride: A scenic mule ride offers a great way to see Molokai’s breathtaking scenery and learn about it’s history. Kahiwa Falls: A tiered waterfall on Molokai’s northern shore. Can only be seen from the see or the air. Halawa Beach Park: Beautiful beach and docent-guided, narrated hike about the history of the area. Kapuaiwa Coconut Grove: A historical coconut grove with trees that have been standing since the 1800s. Molokai Forest Reserve: A nature preserve offering off-road adventure, hiking trails and scenic views. Kakahaia National Wildlife Refuge: A wildlife refuge that protects the wetlands and habitats of waterbirds. One Ali’i Beach Park: A long narrow beach with poor swimming conditions but good for fishing and picnicking.